This thesis report is paper based, and as such contains a series of 7 journal and book chapter publications published as part of my PhD research. Each paper has its own problem statement, research question, theoretical framework, and methods section, which are not repeated in this introduction. Due to the paper-based setup of the dissertation, this introductory section is of a different nature than the traditional introduction found in many thesis books at the Faculty of Architecture. The goal of this introduction is not to give a comprehensive introduction to aspects of the research, but to explain the relation between the different publications, which are subsequently included as chapters. This book chapter describes the current practice with regard to combined approaches for flood risk management and spatial quality enhancement in the Netherlands. Currently, there is a requirement to extend the current flood risk system because of increased flood risk (caused by climate change and increased investments in the protected area) and new insights with regard to acceptable risks. Flood risk measures nowadays need to be implemented in a context in which local stakeholders emphasise aspects such as spatial quality and ecology. In this contemporary context, we see interesting developments with regard to combined approaches for flood risk protection, such as, for instance, the experimental flood proof building programme, the ‘building with nature’ concept (in which natural principles are employed for flood risk protection), the atelier for coastal quality (that as part of the Delta Programme developed integrated designs for coastal protection and quality) and the ‘Room for the River’ project (in which, as an alternative to dike reinforcement, the water load is reduced by creating extra space for the river to expand). For this research, the ‘Room for the River’ project is an important reference. Within the project, which aims to address more extreme river discharges, spatial quality is an important secondary objective. Next to the availability of extra budgets, a ‘Quality Team’ was established to supervise the inclusion of spatial quality objectives. The project addressed the growing resistance against the elevation of traditionallybuilt levees, by offering an alternative option of lowering the water levels by improving the flow capacity of the river (for example, by creating a bypass to widen the river). Within the development of the combined method for flood risk and spatial quality, different aspects have been inspired or based on the ‘Room for the River’ approach. Among such aspects are the dual flood risk and spatial quality objective, the principle of providing alternative options for flood risk management interventions, and the inclusion of a spatial quality assessment. This paper can be seen as the overall introduction in which the Rotterdam Rijnmond case study region and its spatial and flood risk challenge are introduced. It describes the strong historical relation between flood risk management interventions and the spatial development of the region. The region is protected against floods by an extensive system of (sea)barriers and dike-rings. Positioned on the edge of the Rhine-Meuse delta, the region developed as a port area and is part of the so-called Randstad area: the most densified area of the Netherlands. Due to climate change, increasing sea levels and peak river discharges are expected in the future, resulting in an increased flood risk. In order to address this future flood risk challenge, the second Delta Committee was established - the first Delta Committee was established after the 1953 flood that flooded part of the Netherlands. This Delta Committee develops regional strategies for flood risk reduction for the long-term period, up to 2100. As part of the strategy development process, four conceptual regional flood risk reduction strategies are developed, which can be perceived as cornerstones of the playing field of possible flood risk reduction strategies for the region. Those cornerstone strategies vary from the complete damming of the delta (thus lowering the extreme water levels behind the barrier) to opening up the delta and dealing with the expectedly high water levels by elevating the region’s dike-rings. The different cornerstones offer different potentials and threats for the spatial development of the region. In addition, at a local scale, the different cornerstones impact the spatial quality of the dike zones and flood plains in different ways. This strong relation between the flood risk management interventions and spatial composition and quality of the region supports the urgency of approaching the future flood risk reduction task in a comprehensive way. 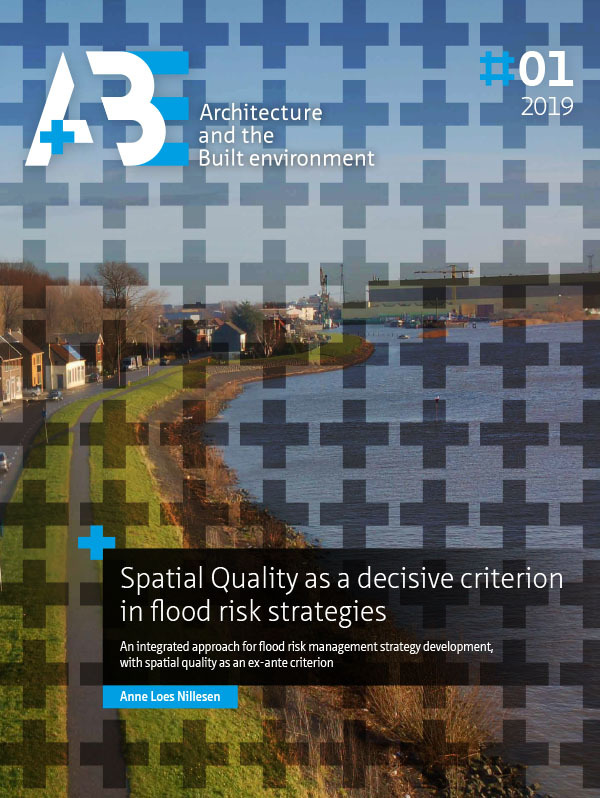 This paper describes the application of a research-by-design approach that aims for a combined approach for spatial quality enhancementand flood risk reduction, with spatial quality as a decisive exante criterion. In order to achieve this, as in the ‘Room for the River’ programme, a dual flood risk and spatial quality objective is set. This research was performed as part of the ‘Atelier for Coastal Quality’, in which The Hague’s seaside area of ‘Scheveningen’ was selected as a case study location.Here, the future reinforcement of the sea barrier could be combined with addressing the challenges of improving spatial quality, among which are: identity, vitality, attractiveness, and connectivity. A research-by-design approach was deployed in which a single parameter was systematically varied (the flood risk intervention) while fixing other parameters (such as the context and the objectives from a spatial and flood risk perspective). After exploring and defining both the flood risk and spatial objectives for the area, three alternative flood risk reduction strategies (based on three alternative interventions: a boulevard, dunes, and a perpendicular dam) for Scheveningen were developed. In order to facilitate the integrated design process, ‘Delta Ateliers’, in which multidisciplinary experts and stakeholders interactively worked together, were successfully deployed. As a result, it became apparent that the inclusion of a prominent spatial objective is not the main key to including spatial quality as an ex-ante decisive criterion in defining flood risk strategies. The three proposed flood risk reduction interventions had all been successfully embedded with regard to meeting the prescribed spatial criteria, thereby disqualifying the spatial aspects as selection criteria for the flood risk intervention. However, as part of the study, a supporting research-by-design exercise was performed in which three different locations for the positioning of the perpendicular dam, were explored from a spatial perspective. Here, it seemed that providing interchangeable (similarly effective) interventions at different locations did result in very different potentials for spatial quality, thus allowing spatial quality to become a decisive selection criterion. The ‘Room for the River’ principle, which appeared essential in order to include spatial quality as a decisive ex-ante criterion, is the creation of alternative exchangeable options for the flood risk reduction interventions at different locations. Based on these findings, the research-by-design approach deployed is extended to not only systematically test different interventions, but to also systematically vary the location of the intervention. The ‘Delta Atelier’ multidisciplinary workshop approach is continued within the remaining research. In this paper, the development of a method to assess the impact of a flood risk intervention on spatial quality is described. In order to make spatial quality a decisive criterion for the selection of flood risk management interventions, the assessment of the impact of an intervention on spatial quality should be assessed in a verifiable and reproducible way. As described in the first publication, the Delta Programme defined four alternative system strategies for the reduction of flood risk in the Rijnmond Drechtsteden area. In this research, the developed method is deployed to assess the impact of those alternative system scale interventions on local scale spatial quality. The developed method is based on the ‘Room for the River’ assessment framework for spatial quality, which is based on a combination of a criteria checklist and expert judgement. The Room for the River method is developed to test elaborate design proposals in a rural setting. In this research, the framework is adjusted and extended to test more conceptual interventions, and criteria are altered to fit the more urban setting of the Rijnmond Drechtsteden area. In the research, the criteria on the checklist (which are based on the perception of spatial quality of a combination of utility, attractiveness, and robustness) are only considered when deemed relevant by the experts. The checklist supports the expert judgement in two valuable ways: firstly, as a tool to during consecutive assessments provide the experts with a coherent and wide view of criteria, and secondly, to make the assessment verifiable and open to discussion. Adapt the spatial assessment framework to specific conditions for a case study area. Visualise the various (local-scale) locations that need to be evaluated in a consistent and neutral fashion. Assess the new situation related to the flood risk protection strategy, using an expert team and relevant criteria from the framework. Though time-consuming, the assessment framework works well in achieving verifiable assessments regarding the impact of regional and local flood risk management interventions on spatial quality at a local scale, in this particular case study, by allowing the local scale spatial quality to function as a selection criterion for selecting a regional flood risk management strategy. In this dissertation research, spatial quality is aimed to be a criterion in strategy development and not just in selecting already composed strategies. In order to achieve this, in an earlier research stage, different measures will have to be assessed, and, based on the assessment, be selected or omitted as components of a regional flood risk management strategy. In this publication, the developed integrated method for including spatial quality as an ex-ante criterion in flood risk management strategy development is presented in detail and tested. Based on the results of the earlier research-by-design exercise, as described in the third publication, it is concluded that the key to making spatial quality an ex-ante criterion is to make sure sufficient interchangeable flood risk management interventions, with varying locations, are available, since having multiple effective measures from a flood risk perspective makes selection based on other criteria, such as spatial quality, possible. In this paper, the ways in which a range of interchangeable measures can be included by considering flood risk management interventions at different scale levels (varying from system scale to local scale interventions) and at different flood risk layers (including both flood risk reduction and consequence reduction measures) is described. As a base reference situation, the impact on spatial quality of the ‘business as usual’ flood risk management strategy for this region is assessed. Subsequently, the ways that the flood risk management interventions can be shifted away from the locations in which they have a negative effect on spatial quality, by considering alternatives with a better (preferably neutral or positive) impact on spatial quality is tested. This is done by systematically deploying interventions at different scale levels and safety layers, while assessing their impact on spatial quality. Based on this assessment, the combinations of measures that result in an optimal impact on spatial quality, can be selected for the regional flood risk management strategy. In the previous paper, the aspect of including interventions from different flood risk safety layers is explained quite concisely. In this publication, an extended approach for the inclusion of interventions from different flood risk layers are described in more detail. The paper demonstrates how the Netherlands’ policy shift from a probability-based flood risk target to a risk-based flood risk target increased the range of interchangeable measures for flood risk protection. Though applying a risk-based mindset, the Netherlands’ flood risk reduction targets were, until recently, defined as probability-based safety standards. This resulted in a uniform dike-ring approach in which different dike-rings have different safety standards, based on, amongst others, the perceived economic value of the area, which are applied uniformly to the whole dike-ring. Within this probability reduction based system it is possible to define interchangeable flood risk management interventions at different locations, for instance, by proposing interventions of different scales, as demonstrated in the previous publication. The ‘Room for the River’ project is an example of providing alternative probability reduction measures, since both dike elevation and load reduction reduce the probability of a flood. However, applying risk-based flood risk targets conceptually considerably extends the amount of interchangeable flood risk measures. Not only does it, next to probability reduction measures, allow for the inclusion of consequence reduction measures (such as flood proofing buildings, elevating areas, and improving evacuation), but compared to the uniform dike-ring approach, it also allows for differentiations in probability standards per dike segment. This conceptually more fine-meshed perspective of the dike-ring extends the amount of variable locations for flood risk management interventions. In the research-by-design study described in this paper, the examined method for the aspect of ‘changing the layer of the flood risk intervention’ is applied to the Albasserwaard case study area. The paper demonstrates how the Netherlands’ recent shift from a probability standard target towards a risk-based target, by increasing the amount of interchangeable flood risk management interventions for the case study area, strengthens the possibility of deploying the developed method and the use of spatial quality as an ex-ante criterion. The spatial ambition map developed for the Alblasserwaard-Vijfheerenlanden case study, which is included in this chapter, is a valuable example of how to inventory the spatial-economic ambitions and challenges of the location. Is it possible to define an integrated method for strategic flood risk management and spatial quality enhancement, in which spatial quality is a decisive ex-ante criterion, and what would be the key elements and steps in such a method? This constitutes the primary research question. The publications that together form this dissertation describe such a method and thus provide a positive answer to the primary research question. A key principle in the approach is the inclusion of multiple interchangeable (effective) flood risk reduction interventions at varying locations, so that the criteria of spatial quality can become decisive in flood risk management strategy development. The ability to assess the impact of different interventions on spatial quality is essential. In order to do so, an assessment framework was developed; it combines the approach of a spatial quality criteria checklist with expert judgement. The checklist supports expert judgement in that it keeps a wide, open perspective while assessing the spatial quality of a conceptual intervention, and thus allows verifiable and reproducible assessments. The proposed methodology creates opportunities for designers to actively participate in debates concerning the location, layer, and scale of flood risk management interventions, resulting in a more integrated design approach. The systematic approach and the strong connection to variables and data sets provides a framework that makes it easier to communicate designers’ propositions from a spatial point of view to engineers and facilitates interdisciplinary cooperation. The developed sub-method for evaluating interventions at different flood risk levels, to shift flood risk management interventions to the most suitable locations, offers a framework for developing a combined probability and consequence reduction strategy. This method can become a valuable tool for strategy development and decision making in so-called multi-layered flood risk management approaches, in which interventions regarding the probability and the consequential damage of a flood are combined. Multi-layered safety approaches have often been referred to in flood risk management debates in the Netherlands, but so far, consistent methods for achieving a balanced probability and consequence reduction strategy have not been put in place.